It’s often said that the only creature to survive a nuclear explosion will be the humble cockroach. With that in mind, this hardy insect has inspired the design of a tiny compressible robot that's capable of squeezing into tight small spaces — like those created by the rubble following a building or tunnel collapse. Cockroaches have a host of talents, including the ability to withstand a surprising amount of pressure, and a knack for getting into nearly anything. It’s these qualities that a team of researchers at the University of California, Berkeley, are trying to emulate with their first robotic prototype: CRAM (Compressible Robot with Articulated Mechanisms). We prefer to call it Roboroach. To understand how cockroaches come by this ability, the researchers first studied cockroach behaviour. 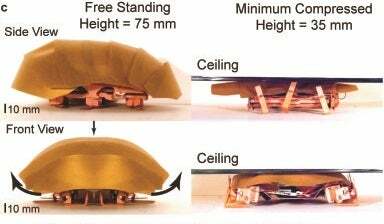 While cockroaches are about a centimetre tall when they’re walking freely, they can compress down to about one fifth of their height; that's the height of two pennies in a stack. When they’re this compressed, they shouldn’t be able to move. Their legs are sprawled outwards so that their feet can’t push against the ground properly. Instead of pushing with their feet, they use the little spines on their legs to propel themselves along. 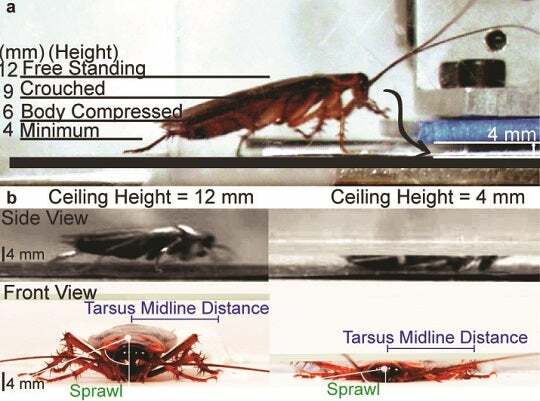 When the cockroach is upright, the spines are sensory organs, but when it’s squished, they provide enough friction for the roach to wriggle forwards. The Berkeley Roboroach has similar physiology. Its legs are capable of sprawling outwards when it is put under pressure and have small bumps along the edges, mimicking the roach’s spines. The Roboroach also has a soft upper shell that protects its mechanisms from damage from a low ceiling — although its shell is made of plastic. Unfortunately, the Roboroach does not yet have the divisive critters' durability. It can only squish down to about half its size, instead of one fifth, and it hasn’t been used outside a lab. The researchers are hoping to make cheap, numerous, and tough real-world robo-roaches. If they’re equipped with tracking sensors, these tiny robots could one day be first-responders to disasters, moving by the dozen onto unstable ground to make their way through cracks and map out the paths through rubble. Not only would that keep rescuers safe, it would help them avoid setting off slides or collapses that might kill any survivors.